This interesting surname is first recorded in England, but also has later Scottish associations. It derives from the personal name Harry, itself a nickname or dialectal transposition from the old French name "Henri". This name translating as "home-rule", first appears in England in its Latinized form "Henricus" in the Domesday Book of 1086, being introduced at the Norman Invasion of 1066. During the Middle Ages the name, as Henry, became enormously popular in England and was borne by no less than eight kings, a record not equalled until the 20th Century, when Edward V111 had his short reign in 1936. 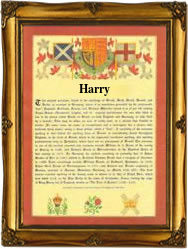 The surname both as Henry and Harry, is first recorded in the latter half of the 13th Century. Early examples of the recordings taken from authentic charters and registers of the period include William Herry, a witness in the court rolls of the borough of Colchester in 1337, and William Harrys of Eynsham, Oxfordshire, in the year 1406. Over the centuries the surname has been variously recorded as Harry, Harrie, Harrhy, Harris, Harries, and Harriss, all but the first being patronymics. Amongst the many interesting namebearers are "Blind" Harry, a court musician (1470 - 1492), Walter Harris, (1647 - 1732), the court physician to King Charles 11, and George Harris, the first baron Harris, general commanding the British 5th Fusiliers at the battle of Bunker Hill, in 1775. The first recorded spelling of the family name is shown to be that of Nicholas Herri, which was dated 1327, in the "Subsidy Rolls of the county of Buckinghamshire", during the reign of King Edward 1st of England, known as "The Hammer of the Scots", 1272 - 1307.